Until most recently, Bennett had been doing really well with his health. His lungs are staying healthy and his GI symptoms were mainly staying at bay. However, as of a few weeks ago, Bennett started showing signs his intestinal stricture is causing him problems again. I contacted his GI doctor to ask if we can move forward with addressing it once again (I had placed everything in hold in September). 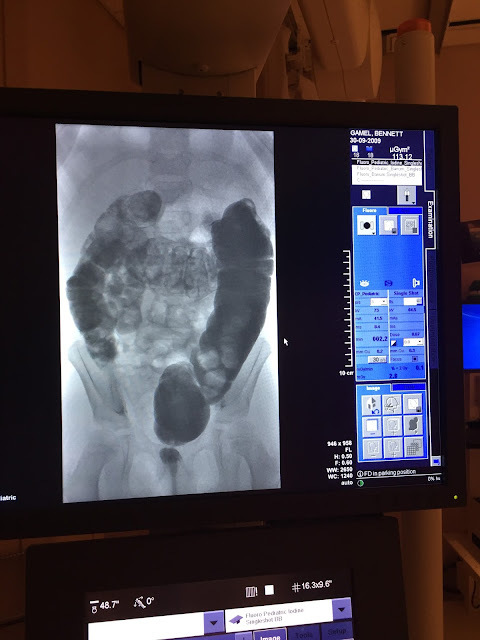 The GI doctor was very responsive, despite she was still out of the office for the holidays, and quickly put him on the calendar for a sigmoidoscopy with dilation. 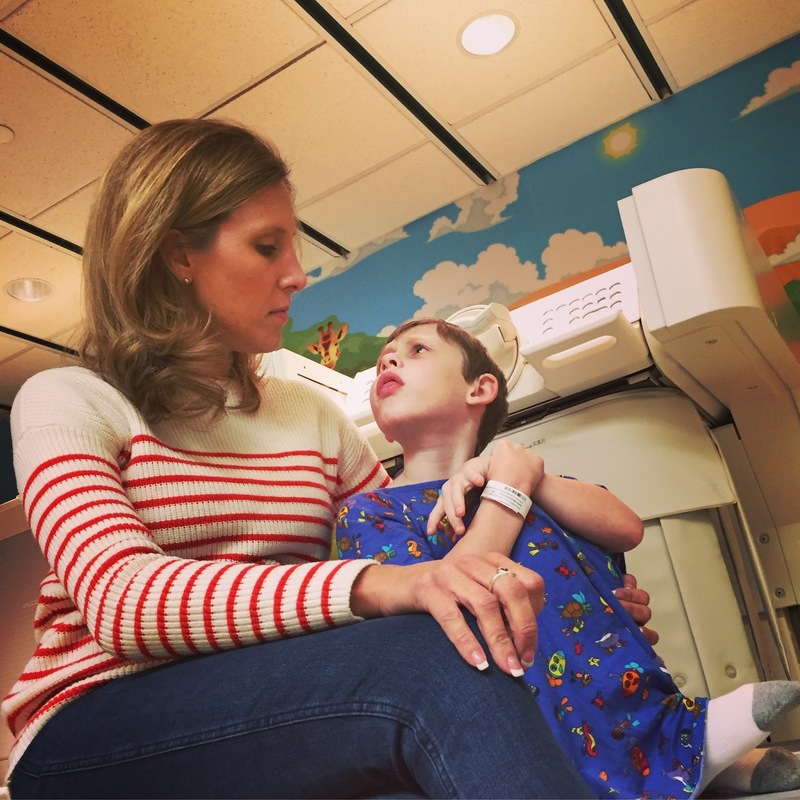 But, as the week marched on, Brian and I began talking about Bennett's stricture, asking ourselves what options exist for addressing this stricture once and for all. I reached out to the pediatric surgeon who has been working with Bennett's GI doctor to see if he thought surgery would be an option. Brian and I haven't been ready for surgery. But, we rationalized, if Bennett is going to have to undergo a 3-day colon prep and be put him to sleep again, maybe we ought to do surgery, a more definite way to address the stricture. Brian and I have decided to move forward with surgery. To prepare for surgery, a barium enema was ordered. On Friday, Brian and I took Bennett to Children's Medical Center for the barium enema in hopes it will give the surgeon more information about the placement of the stricture and to confirm there are no other hidden strictures. 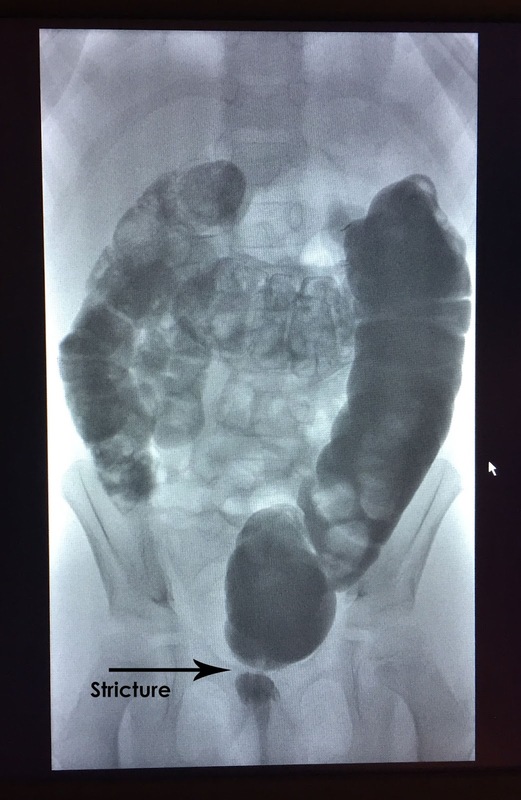 This was Bennett's 4th barium enema. He had one in preparation of his last surgery almost exactly one year ago. It is a very uncomfortable procedure. I knew it would be really hard for him to do again. The procedure consists of a tube being placed in the bottom and clear barium liquid pushed up through the bowel while x-rays are taken. Not only is it scary for a child, the barium often causes cramping pain. I was most worried this time about additional pain caused by his stricture. Thankfully, the X-ray tech was very responsive and decided to place numbing gel on the end of the device that would provide the barium in order to prevent any additional pain that might be caused. Brian was able to join Bennett and me for the procedure since my sweet friend Kelly offered to pick Oliver and Avonlea up from school and watch them until we made it back to Waco. This made a world of difference in regard to how traumatizing this procedure was. Although the procedure was still really hard for Bennett, having both mommy and daddy there made for distraction. In addition, not only did Brian's being there help me to be calmer, having Brian there allowed me to talk to the radiologist and nurses without the feeling like doing so required leaving Bennett alone. We explained to Bennett his only job was to be as calm and relaxed as possible. The X-ray tech explained the importance of taking deep breaths and breathing through it. The entire procedure took about 15 minutes once we began. Bennett did a very very good job despite it all and gave us some great images. Can you find the stricture?? Although we haven't received the official radiology report from the barium enema and we haven't yet heard from the pediatric surgeon on when surgery will be scheduled, we did appreciate hearing the Radiologist say in person that he thinks the stricture is probably less than 1cm (or 10mm). 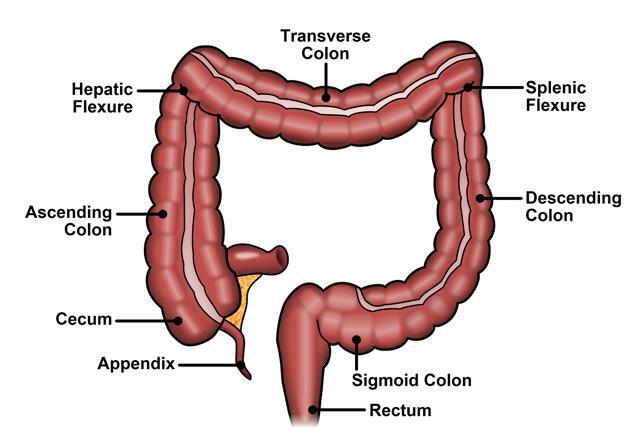 Seeing this picture made Brian and I grateful we have made the decision to resect the colon - to cut the stricture out and reattach/fix the colon to itself. Upon finishing the procedure and leaving the hospital, to our surprise, Brian and I noticed it was snowing outside. Experiencing snow in Texas is a rare, a bit like seeing a rainbow after a thunderstorm. 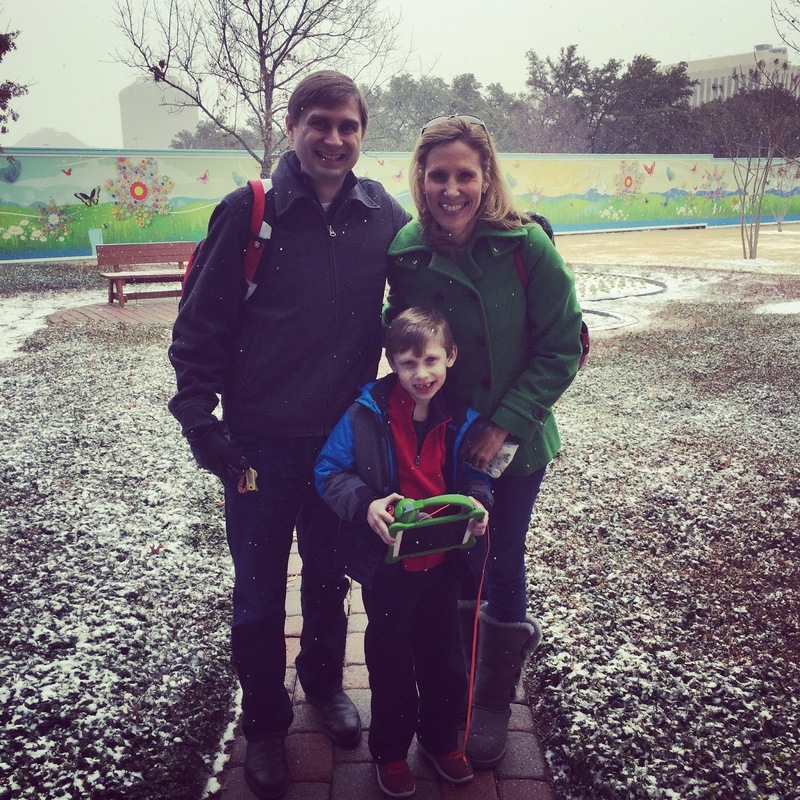 As we were walking out, I wondered aloud to Bennett that maybe God had given him the opportunity to experience snow as a gift to him for his great bravery. Bennett's face lit up. I don't know why God chose to send snow in that moment. But what I do know and what I wanted Bennett to know in that moment is that God is there always - both in the difficult moments and in the magical ones.